Full disclosure: this outfit is from almost a month ago, when the weather was little more layer-friendly. These jeans are pretty old and were in desperate need of a freshening up, er, distressing. A little scissor makeover always does the trick. I've taken to many a pair of old jeans with scissors and a cheese grater — why get rid of good denim when you can give it a facelift! @Liz Exactly! Seam ripper and pumice stone are great distressing tools, too! You are working this look. Those shoes are killer. I love that blazer! And gotta love DIY-ing a nice fix for your jeans! wish u a great weekend! 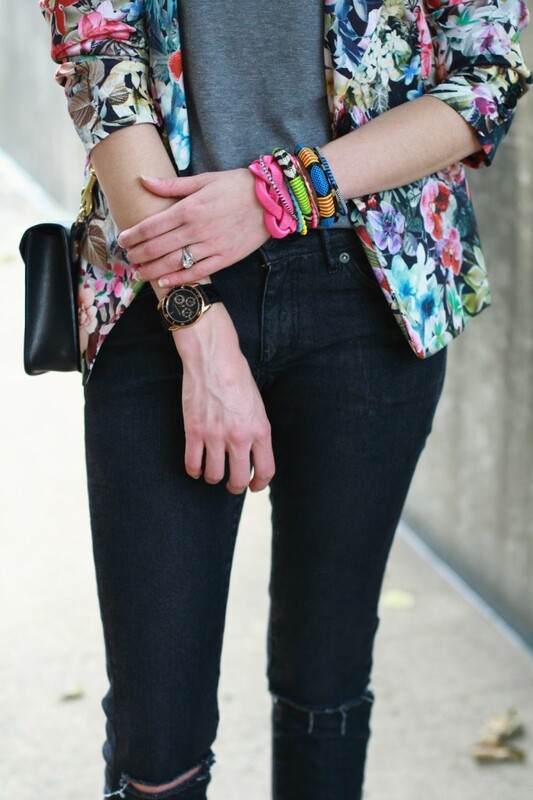 Love the florals E, and your bright bangle stack! Chic outfit, love what you did to your jeans! Damn girl you really have given these skinnies a new lease of life the cool-ometer has just skyrocketed. Love this outfit – especially because it gives you legs for days. Nice job DIY'ing those jeans, too!